I am never one to shirk away from a challenge! 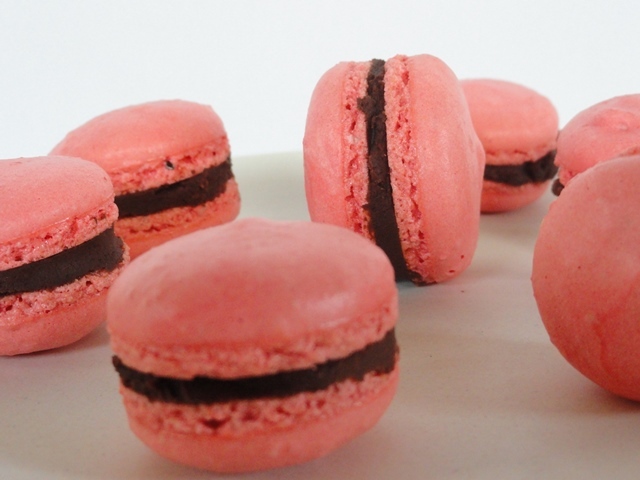 A macaron challenge was issue on my blog in 2010 and I made them, but not perfectly. So, when I saw the same challenge being issued for the October Daring Bakers’ I thought I would make them again, and get the perfect feet and height, required of a macaron. At the same time that this challenge was issued, a new product become available to me, erythritol granules. With the promise of working exactly like sugar I decided I would use this as my sugar alternative for the macarons. Take 1 – try the recipe from Larousse Gastronomique page 629 using 3 egg whites, 205g erythritol granules and 120g ground almonds. Result – flat discs! Not sure if it was the recipe or the erythritol granules. Put these to one side in a lock and go container. Take 2– retry the recipe using 1 egg white, 70g icing sugar and 40g ground almonds. Result – flat discs. Now I think it is the recipe. Put these into a cookie jar for our house guests. Take 3 – try the recipe from a blogger I follow using 2 egg whites, 15g erythritol granules for the egg whites, 125g erythritol granules and 75g blanched almonds. Result – more flat discs. Add these to the lock and go container. Still don’t know if it is the erythritol granules or the recipe. Take 4 – try the same recipe again using 1 egg white, 8g caster sugar, 63g icing sugar and 38g blanched almonds. Result – more flat discs. Use these for a dinner party with the house guests to make a version of Eton mess. Take a break while the house guests are visiting. Take 5 – write down the recipe from Joanne’s blog which calls for 36g egg whites, 18g caster sugar, a pinch of salt, 58g icing sugar and 29g blanched almonds. As soon as I make the meringue I can tell it will be better. Result – stunning macarons. Take 6 – wanting to make 100% sure that the erythritol granules do not work like sugar, I decide to make one last batch. I weigh out the blanched almonds and realize I have not made Joanne’s recipe. I had a new bag weighing 100g to start take 5 and there are only 62g left in the bag #oops. Make this batch using 36g egg whites, 18g erythritol granules for the egg whites, a pinch of salt, 58g erythritol granules and 38g blanched almonds. Result – really awful flat discs where the erythritol granules have caused weeping. I have now wasted all but 79g of the erythritol granules at a cost of R140! Not to mention all the other wastage. Toss these away before they can develop mould. Take 7 – make the final batch which work perfectly – share the recipe here. Not only were the recipes so different, the piping nozzle and method of piping across the recipes differed. So did the waiting time and when and how to tap the macarons. What I can tell you is that these will work! Blog-checking lines: For the month of October we got to take on one of many bakers’ deepest, darkest kitchen nightmares : macarons. My post is late, but I want to thank Korena from Korena in the Kitchen and Rachael from pizzarossa for this task of mastering these French beauties. * I let the supplier know about the mould, but she is convinced the product is safe for use. She has informed me that the product is not like sugar as claimed, and is not a preservative. I would not recommend that you use this, in case mould develops where you cannot see it! I followed the recipe to the t and the batter seemed too thick (I’ve made regular macaroons in the past so I have an idea how thick the batter should be). I let them dry and baked them and sure enough they did not rise as they should have. I used Swerve which is erithytol. Where did I go wrong?? I really want this to work! Hi Sarah. Thank you for the detailed comment. The recipe specifically calls for icing sugar. I would not recommend using erithytol at all. If you read through the post you can see I too had no luck with this sucrose substitute. Might I suggest you try confectioners sugar and let me know the result. Ah I see haha. I skimmed thru the post and assumed you used erithytol as this was one of the results when I searched for erithytol macarons. I decided I don’t like the taste of erithytol anyway so I’ll probably make these with regular sugar. I’ve never tempted these but yours do give me hope Tandy – just look so yummy!! OMG I did that challenge back in 2010! Failed, tried another 2 times and threw in the towel. Hats off for your persistence, they are just gorgeous Tandy! 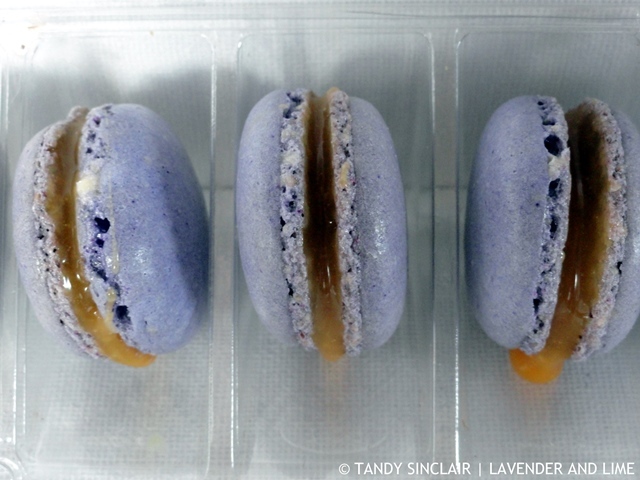 Oh wow – thanks for persevering through as these macarons are stunning! I’ve always shied away from making them as I’ve been intimidated by them but I better get to baking! Tandy, you have the patience of a saint! These look absolutely mouth-watering. You were definitely a woman on a mission and I’m so glad you had such great success. Oh you’ve done a wonderful job making these macarons. For whatever reason, I’ve never made them myself, but I need to change that as soon as possible. Love this Tandy. Happy Holidays. Well done on persevering Tandy, not sure I would have. Fabulous result for all your effort. OH! These macaroons look fabulous, Tandy. Salted caramel filling in particular looks awesome! What a drama! Glad you stuck at it and loved the way you told the story in diary form. Maybe these can be the first things you make in your new kitchen? I’ve never made macarons but I sure love them. They look terrific. You’ve taken me straight to a Paris cafe with these stunningly lovely macaroons. That salted caramel filling in particular looks amazing! Macarons are my ultimate weakness ~ love them!! I’ve always wanted to conquer macarons! These look fab, Tandy! Thanks for the tips! You are one courageous lady, Tandy, 7 takes and it worked! Macarons have been on my list for a long time but judging from my making meringue that turned out very flat as well (but tasted ever so delicious with the right gooey moisture inside) I am still hesitating. Thank you for pointing me in the right direction. What are you doing with all the yolks?